The Capitals season is over. However, that doesn't mean your fandom needs to end. Being able to critique every move your favorite organization makes this offseason is a right not only reserved for fans of basement dwellers and Cup champions, but also for fans who got their hearts ripped out during a playoff run. 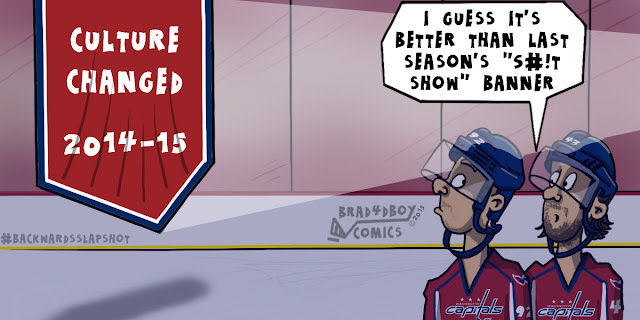 Speaking of that, how did the year go Caps fans? Too soon, I know. Other than experiencing a crushing defeat in the conference semifinal game seven overtime, it does appear that the Caps have successfully changed the "culture" surrounding the team. But what does "culture change" even mean? Certainly not much for fans. I mean, was the team using more cheese on the nachos? Were the usual intermission gimmicks replaced with mandolin lessons? Were they blasting inspirational quotes into the stands instead of t-shirts? I guess for fans, the only real evidence of a team's "culture change" is in how the players, coaches, and management talk about one another. How they describe their day-to-day interactions. How they talk about wins, losses, awards, mistakes. And since we're not able to attend team meetings, and only witness practices from afar, we have to read a lot into what players say, and how they say it to the media. It's not an ideal way of gauging success, but in that regard, things certainly seem different. Change certainly involves everyone, but Barry Trotz's role in the Caps' shift appears seismic. Trotz added a unique gravitas that was missing in the Caps organization. And unlike some folks' massive presence, his contains humility. To the Caps, more important than his resume was his personable, family approach to the team. This meant the world to a team that had been previously sucked dry of any and all humanity by an overly impersonal, analytical Adam Oates. Trotz was able to allow players to have an individual voice, but also develop a cohesive team identity and vision. He allowed Ovechkin to drive the car, but let everyone else take a turn. To accomplish this, I'm guessing Trotz didn't just tell players what to do and then ask them to simply "buy-in" (or not). While his own rhetoric sometimes points to that as a tactic, my guess is that it was much more of a collectively facilitated team effort - one that included the captain, other veterans on the team, and even the newcomers. And if this wasn't his tact, then Trotz will likely have the shelf-life of every other coach who tells people what to do and asks them to "believe" and "buy-in" (avg. tenure of an NHL coach hovers around 2.5 yrs). Either that or people around Trotz (i.e., Brian MacLellan) will have the job life-cycle of a mayfly and a new GM will oust the coach before he's able to establish any true growth and development within the group. Coaches like Mitch Korn and Todd Reirden are other great examples of a change in positive relationships. These two assistants, like Trotz, were able to establish relationships with the goalies and defensemen respectively that allowed Holtby to have a confident, career defining season, and also allow Mike Green to happily adopt (and identify with) a lesser role/identity for the good of the team - in a contract year nonetheless. All of this is to say: the Capitals did seem to change the culture surrounding this team. As hard as it is for fans to experience first-hand, this team seems to have proved that "culture" is a thing that can/should change in some organizations. Will the shift result in developing a perennial Cup contender or likable loser? We won't know that for at least another year or five. Either way, this offseason will provide more material for fans to argue one side or another. That, or time to crochet a new Ovi sweater for next year. Happy offseason! The line of Burakovsky, Beagle and Brouwer has done its part to help Holtbee, err, Holtby and the Capitals chase the Rangers back to New York on the brink of elimination.. Head over to Japers' Rink and read more about the Caps Killer B line here.